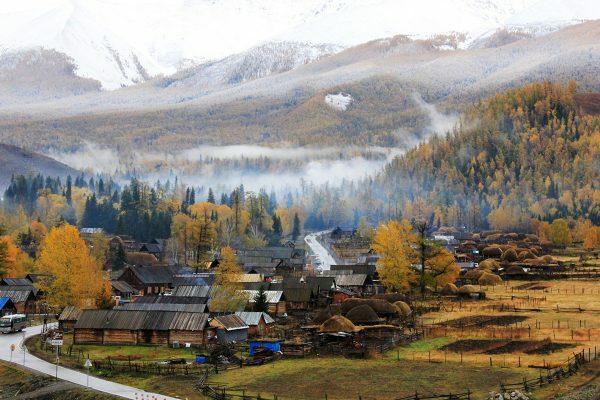 With titles like “Number One Village of Northwest China” and the “First Village in the Northwest”, there are no prizes for guessing where Baihaba Village might be! It rests on the natural border between China and Kazakhstan, at the very northwesternmost corner of China’s Xinjiang Autonomous Region. Since it is only 3 kilometres (2 mi) from this border, tourists must get permission before travelling to the village. Its location just 31 kilometres (19 mi) west of Kanas Lake makes it a popular stop on any tour of the Kanas region, but this bucolic paradise is more than just a glorified rest-stop! Flanked by the misty Altai Mountains and split by the shimmering Baihaba River, it’s a veritable utopia for nature lovers. The nearby forests are full of pines, white birches, and poplar trees, meaning the landscape is awash with luscious greens, pearl whites, and deep chestnut browns. Temperatures in this virtually Siberian region regularly plummet to below 0 °C (32 °F) in autumn, yet photographers annually brave the cold to enjoy this most picturesque of seasons. When the leaves turn, the forests are flecked with reds, golds, and yellows that perfectly complement the dark green pines. The village’s characteristic log cabins blend seamlessly into their natural surroundings, with only the faint wisp of smoke from their chimneys indicating that they are still inhabited. No matter what the season, the scenery in Baihaba looks like it has just leapt out of a pastoral oil painting! Water trickling down from the melted ice-caps of the mountains runs through the village’s centre and forms the Baihaba River, separating the community of Tuvan people on one bank from the Kazakh people on the other. Although they come from distinctly different cultures, these two ethnic groups have shared this fertile land and enjoyed a peaceful rural life for decades. The Tuvans are a Siberian people who have Mongolian, Turkic, and Samoyedic roots, while the Kazakhs are a Turkic people who mainly live throughout Central Asia. The Tuvan people believe that they are descended from the legendary soldiers who served under Genghis Khan, so many Tuvan homes boast a portrait of the great Mongolian warlord above their fireplace. Similarly, the Kazakh’s trace their ancestry back to several medieval Mongolian tribes, including the Argyns and the Huns, as well as ancient Iranian nomads such as the Sarmatians and the Scythians. Although both groups speak their own language, the Tuvan’s Turkic language has been heavily influenced by and bears great similarity to the Kazakh language. So it seems these two diverse ethnicities have more in common than meets the eye. And they both certainly have impeccable taste when it comes to their choice of location! Thanks to their relative isolation and remoteness, the villagers have managed to preserve their unique traditions and customs. Their homes are lavishly decorated with hand-embroidered tapestries, which add a smattering of colour to their modest furnishings. They cook their meals over quaint woodstoves and sleep on heated brick beds, living a life of humble simplicity. Although tourism now plays an important part in supplementing their income, many families still rely on hunting and raising animals for their livelihood. Every day, farmers graze their sheep and cattle on the verdant pastures, while women wash vegetables in the river and youths ride their horses deep into the mountain valley. Some of the locals run horse rental businesses, offering guided tours of the countryside for those visitors adventurous enough to take the reins! A handful of Tuvan families have even opened small hotels or restaurants, where tourists can indulge in a brief taste of their rich culture. And the good news is most Tuvan people greet their guests by giving them snacks! Normally they will receive guests with an array of delicious home-made dairy products, such as yogurt, milk wine, milk tea, and freshly baked cakes. Generally speaking, it is not considered impolite to refuse the food, but some B&Bs will welcome visitors with a Tuvan tradition involving two compulsory bowls of milk tea. The host will pour the first bowl and offer the drinker butter, which they can add to taste. As soon as the first bowl is finished, the host will fill it again. According to local belief, it is this second bowl that will grant the drinker good luck. That is, unless you’re lactose intolerant!